11:15PM Curved Air “SITUATIONS” from Air Conditioning (1970) on Warner Bros.
Coast Community Radio presents Imbolc, the Pagan Call for Spring, the ritual warming of the Earth for the planting of our Seeds. Join the Pagan Pancakes and the Maidens of Imbolc in their Dance for the calling of Spring accompanied by Gypsy Kim and Josef. More music by Ray Prestegard, plus ANiTiZE. Saturday, January 28. Music starts at 8pm. Location is the ASOC Theater, 129 W. Bond Street in Astoria. Sponsored by Fort George Brewery and the North Coast Food Web. 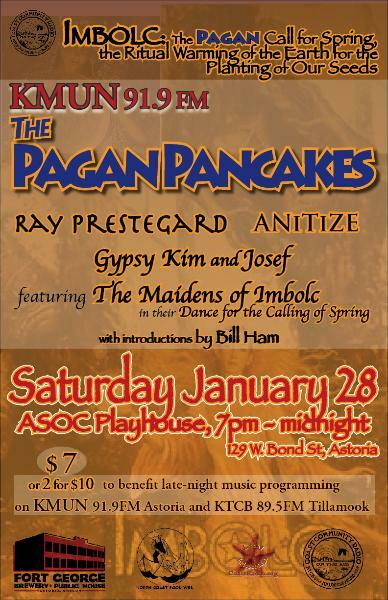 Admission is $7, or 2 for $10, to benefit the late night music programs of KMUN Astoria and KTCB Tillamook. KMUN Day of the Velvet Voice playlist 2 January 2012- Happy New Year!